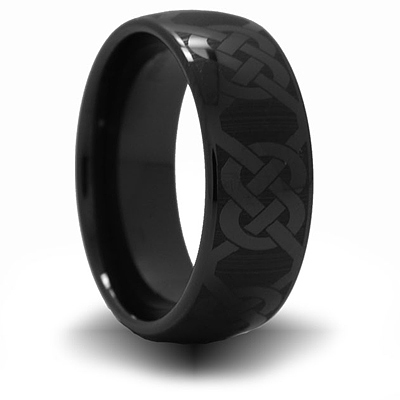 Black ceramic 8mm ring has a laser engraved knot design and high polish finish. Domed center. Comfort fit. Made in USA. I bought this for my husband a good wedding ring. We wanted something unique and durable because he's hard on rings with his work and this ring seemed perfect from what the sales person I talked to said, but it started wearing and getting scratched up in less than 1 month. I am a Marine and my job requires me to wear non-metal jewelry. my wife purchased two replacement wedding bands that are pure ceramic. more handsome than the other bands we had. thaks.